Unplanned pregnancy is one of the most difficult experiences a woman will ever have to face. Right now, you may be feeling especially scared or confused about what to do next. You are now months into your pregnancy and feeling all sorts of major changes happening to your body and mind. You also know that some big decisions lie ahead, and may be feeling overwhelmed by all that is happening at once. If you are facing an unplanned pregnancy, it is important to know that there is support available to you. Your second trimester is a time for big changes and important decisions, and you should never feel like you are in this all alone. Adoptions With Love is always here for you, to help you explore your options, find pregnancy care and resources, and make the best possible decision for your baby. We offer free-of-cost, free-of-pressure unplanned pregnancy advice and services to expectant mothers nationwide. That all starts now. To help you through the many stages of your pregnancy and prepare to make a decision for your baby, we have created a “Month-by-Month” guide for expectant parents. Here, you will explore your different options, learn what to expect during each trimester of your unexpected pregnancy, and find out how to make an adoption plan. If you are in your second trimester currently, keep reading for some of the most important unplanned pregnancy advice from Adoptions With Love. During your second trimester, you should take time to again research and reconsider your different pregnancy options. No matter how far along you are in your pregnancy, you still have the option to parent your child or make a loving adoption plan. Before you make this decision, however, it is important to think about what you want for yourself and for your child. Ask yourself questions such as: Am I truly ready to raise a child? Am I emotionally and financially in the right place? How will having a baby affect my life and personal goals? Can I still go to college and fulfill a career while raising a child? Where do I see myself in five or ten years? Is there a child by my side? Am I happy? Thinking about your own, as well as your child’s, wants and needs can help you decide on the path that is right for you. If you find in your heart you are not ready to become a parent, you might consider placing your baby for adoption. You can learn more about this positive alternative from a trusted doctor, counselor, or adoption professional. While you do not have to make an immediate decision, making a plan for your baby now can help prepare you for the road ahead. If you start an adoption plan, for example, you can get many of your expenses covered, choose an adoptive family for your baby, and prepare emotionally for the placement. Having a plan and knowing what you want can also make it easier to tell family and friends the news. Deciding to parent or make an adoption plan is a difficult and momentous decision. Right now, you probably still have many questions or hesitations. Finding the right support as you work through your thoughts can make all the difference. You do not have to do this alone. If you have not already, now is the time to seek professional support and build a network of resources to help you through this process. Speaking with an adoption professional can be very helpful as you navigate your unplanned pregnancy. At Adoptions With Love, we will work closely with you to explore your pregnancy options, as well as the benefits and challenges of each choice. We will listen to your wishes and answer any questions you might have (we encourage you to make a list of questions for us!). All interactions with Adoptions With Love are completely confidential, so you can always express yourself openly and honestly in a safe place. Through Adoptions With Love, you can also attend birth mother support groups and speak with other women who have been through this experience. They can offer you personal, unbiased unplanned pregnancy advice and will welcome you to explore your feelings with them. It is important to know that meeting with an adoption agency does not bind you to choosing adoption. Adoptions With Love is here as a resource for you. Our counselors are compassionate and will never judge you or pressure you into a decision. We will always respect you and your choices, no matter which path you choose to take. We understand that this is your child and only your decision. At this stage in your pregnancy, you are likely starting to show. Your belly is getting bigger, your hands and feet may be swelling, and your emotions are all over the place. Not to mention, your baby is now about two pounds and has probably started to kick and move around. It is getting harder and harder for you to hide this from other people in your life. The second trimester is about the time expectant parents will share the news about their pregnancy. If you are facing an unplanned pregnancy, however, delivering that news might not come so easily. Up until now, you have likely kept your pregnancy a secret from most – if not all – people in your life. We understand this completely. Telling your friends and family, as well as the father of your baby, is one of the most nerve-wracking parts of the unplanned pregnancy journey. If you feel uneasy about sharing the news, consider asking a trusted friend or counselor to stand by your side or help you prepare for the conversation. An Adoptions With Love social worker, for example, can help you plan how, where, and when to tell your loved ones. We can also help you tell the biological father and help him understand the positive choice of adoption. If you do not have a good relationship with the father, we can contact him so that you do not have to speak with him directly. It helps to first share this news with people you trust and who you know will support your pregnancy – perhaps a best friend, your parents, or your boyfriend. By doing so, you can practice having the conversation as well as build your confidence for telling others. The support of trusted friends or family will also mean a lot as you explore your different options and continue navigating the pregnancy. Remember, if you need counseling or unplanned pregnancy advice, know that Adoptions With Love offers free services to any woman exploring her options. As part of those services, we can help you tell friends, family, and the birth father about your pregnancy and potential adoption plan. If you do not want to tell your friends or family about the news, we will also support you. Adoption is completely confidential, and you have the option to keep yours private. 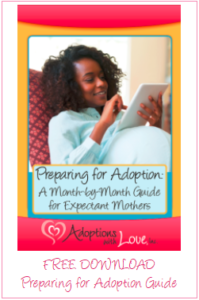 For more unplanned pregnancy advice, you may download our free “Month-by-Month” guide below. To learn more about making an adoption plan, please call Adoptions With Love toll-free at 800-722-7731 or text us confidentially at 617-777-0072.